Just because horseshoe crabs have a menacing appearance doesn’t mean they’re going to go medieval on us when we encounter them on the beach. Poor girl didn’t quite make it back from whence she came. 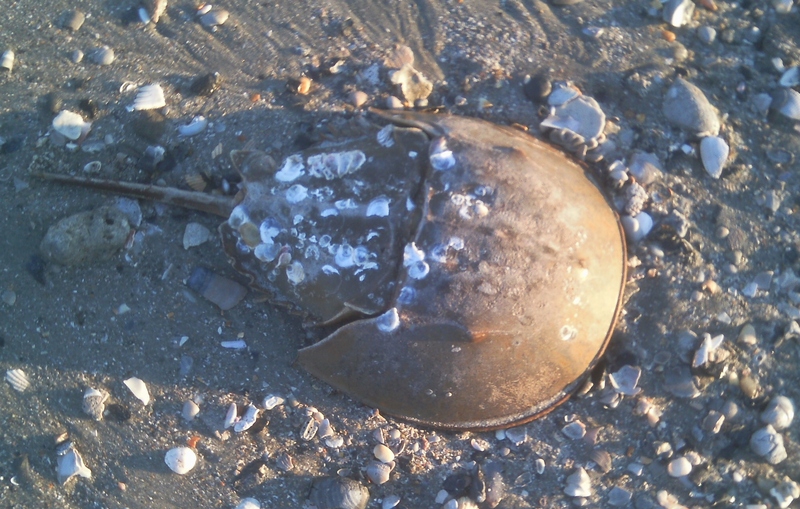 Female horseshoe crabs are larger than males and this one was well over a foot long. Horseshoe crabs are domed-shaped in the front with gnarly-looking posterior segments that include a series of prongs lining the edges of their exoskeletons. They have twelve eyes, but its the two eye coverings in the front that make them look intimidating. They’re slanted downward like Spock’s eyebrows. Are you angry with me or were you born with a chip on your shoulder? The invertebrates have been around for a few hundred million years and are known in some circles as “living fossils.” Perhaps their stone-cold appearance has something to do with that. Horseshoe crabs could easily pass for something that came from outer space. They are, in fact, alien to us, coming from a world that is still very much a mystery. Horseshoe crabs spend much of their lives in coastal waters and estuaries, searching for mates, clams, crustaceans and worms. I dig it. Except for the worm part. Gotta draw a line in the sand somewhere. A friend of mine, now pushing 70, told me they used to amass in Spivey Swash in downtown Myrtle Beach before civilization encroached upon it. They’ve always reminded me of tanks. Miniature tanks with tails. They can’t hurt us with those tails. They use them to steer or to right themselves when turned topsy-turvy by the surf. The spineless wonders molt their exoskeletons several times during their life spans, and years ago I found one of their shells on the beach. I put it atop a lampshade and light shone through its eye coverings. The devilish looking mask fit in well with my Captain Ahab decor. I liken Horseshoe Crabs to career politicians. They haven’t evolved in millions of years, spend a lot of time with their heads buried in the sand and have no backbone. The difference is: horseshoe crabs are lovable. There I go making more friends again. Running out of bridges to burn. Good thing I can swim. I learned a lot while researching horseshoe crabs for this blog. They often swim upside down, so I’d worried needlessly when returning a few live ‘uns to the ocean over the years, watching with concern as their twelve, reddish legs wriggled in the sudsy breaker foam. If you look close enough at their brownish bodies, you can see hints of blue in them. That’s because their blood is blue. Proteins called hemocyanins that spread oxygen throughout their odd bodies. This is my idea of a table setting. Horseshoe crabs avoid rough surf when spawning and they do so in numbers, gathering on beaches within bays, coves and in the muck and mire of river estuaries. Orgies and crabs. Who knew? Peak activity occurs as the days lengthen, often coinciding with high tides during full and new moons. Females lay 80,000 eggs or more a year and they must for their species to survive. Eggs and larvae are eaten by shrimp, crabs, fish and shorebirds. Sharks, conches, sea turtles and eels are known to eat adult horseshoe crabs. Not surprisingly, humans may be the biggest threat to them. We harvest them for fertilizer and livestock feed, and we also use them for biomedical purposes. I can’t pass through Ripley’s Aquarium in Myrtle Beach without checking out a pool of them centered in the main lobby. Ripley’s may not be among the biggest or nicest aquariums, but it will always be my favorite attraction in town. Stop in next time you’re in town. Knowledgeable attendants are more than happy to supervise you if you care to pick them up and take a look. About the only way you can get hurt is if you pinch your fingers between their hinged carapaces. Remember to be gentle. Their future may be in our hands. omg i saw one of those in the creek next to the bird sanctuary. he was gigantic…i’ll be durn, but i thought the sea urchin was a pine cone & i wondered where the trees were…i couldn’t find the reply box on the sea urchin page, but it’s probably me. Hey, raechelsheart, sorry it took so long to reply. I’ve been taking a bit of a break. These horseshoe crabs are like dinosaurs. From another age. Laughed like heck about the sea urchins. 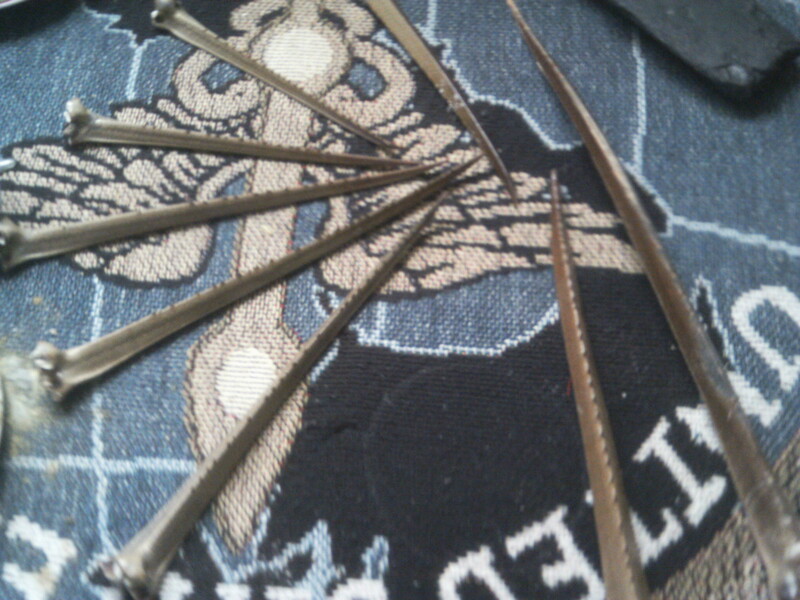 Strange looking and I can see where they could be mistaken for a pine cone. Also, I’ve been looking for a new design with a more accommodating reply thingy. People are always teling me they have trouble commenting. That isn’t good. Rob!! the knowledge i just learn,i’d like to thank you! no i don’t have to squel, jump away or scream! l.o.l. in away i thought all these years they were preying manises,poisening! thank you n funny you mentioned the sea turtle i put a picture of one on my timeline! do you have any blogs on them? shared n love this one alot! i acually learned something! smile! Hey Terri. Hope all is going well. My computer is really messed up and I’ve been spending a lot of time offline on a writing project. Search “Sea turtles dig the dark.” Or just “sea turtle” and you’ll find my blog about a sea turtle nest with eggs and all. A loggerhead nested straight down from where I live and I was the third person at the nest in the morning. A city worker found the nest very early in the morning and I got there at same time as MB park rangers. Check it out.